Camayak Blog | What Does a Digital Newsroom Schedule Look Like? What Does a Digital Newsroom Schedule Look Like? As more publishers transform their businesses, several of our customers have asked us to help them analyze the rhythm of their newsroom activity, so they can keep improving their digital strategy. They’ve even allowed us to share some of their data with you. For example, how does a college publication with a frequent print product compare to a digital content agency, in terms of the hours that each newsroom becomes more active throughout a typical week? To start with, here’s how editors at the Duke Chronicle assigned and approved things for publishing last year. Unsurprisingly, editors approved far fewer assignments during the weekend than at any other time. 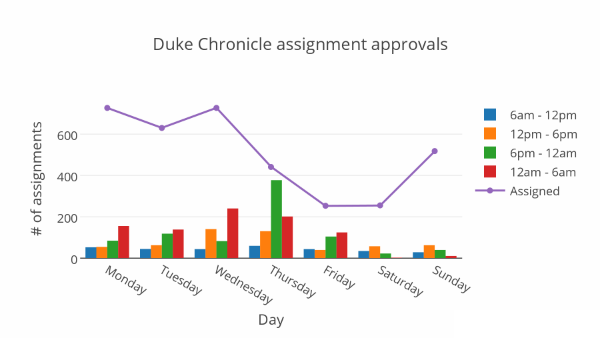 A minority of new articles were approved before noon and there was a clear peak at the beginning of the week, both in assigning new work and approving final drafts. How does this stack-up next to a professional agency that focuses mainly on digital content, relative to the Duke Chronicle which also had a print edition four times a week? Here’s a glimpse of what NYC-based publisher PSFK.com‘s daily assignment activity looks like. The conventional working hours of professional organizations help explain why most of PSFK’s content was approved between Monday and Friday. Interestingly, PSFK’s editors created almost the same number of new assignments every week day, whereas the Chronicle assigned more new work on Mondays than Thursdays and Fridays combined, although they appear to have balanced that with more assignments over the weekends. Finally, due to a combination of factors like the type of work being produced and the schedules of those involved, on average the Chronicle staff took seven hours to complete their assignments, compared to PSFK’s staff, who usually took under two hours. Want to know what else we discovered and see how your newsroom compares? Let us know.